Among newly-launched products into the market, iStick Tria with ELLO S is most impressive for me. I will give my personal reviews on this and I hope this will give you some references. iStick Tria can accept three high-rate 18650 batteries and it’s able to fire up to 300w. Among all the Eleaf products, the vapor production is the most massive. For those sophisticated vapers, using iStick Tria can bring them the most excited experiences and for cloud chasers, it’s also a good choice. Its atomizer owns retractable top that can make e-liquid filling easy. Besides, it supports upgradeable firmware and 2A quick charge which can shorten your charging time. All parts of it can be detached and reassembled which it’s convenient for you to clean and use. iStick Tria uses three batteries and it’s still very powerful when you have used it for a few hours. It has owned successful experience in using three batteries system for it ensures charging safety as well as strengthening its power. The 0.91-Inch screen with triple battery bars can let you know in time which battery should be changed. 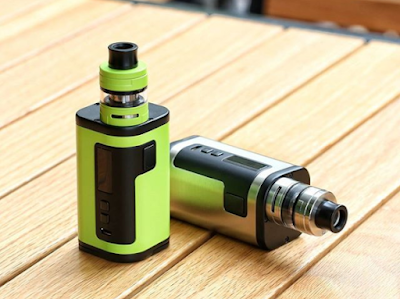 On top of that, its overall compact profile and stylish appeal are also attractive because it will make you feel comfortable when you are holding it and make you stand out among many vapers. With its HW coils, iStick Tria can enhance the flavor, giving you a better experience. Having seen all these distinctive features of iStick Tria, are you desired to buy it or do you have some other problems? No matter how you feel about this, I believe iStick Tria will not let you down.